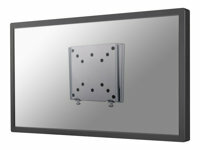 Wall mount for LCD display, lockable, silver, screen size: 10"-30"
The NewStar FPMA-W25 is a fixed wall mount to mount a LCD/LED/TFT screen on the wall. With a depth of only 1 cm, this mount is one of the flattest wall mounts available on the market. It can be used for flat screens up to 30" with a maximum VESA hole pattern of 100x100 mm. The maximum weight is 30 kg. The product also has the opportunity to lock the flatscreen. Mount your flat screen like a painting on the wall with this smart wall mount system from NewStar.